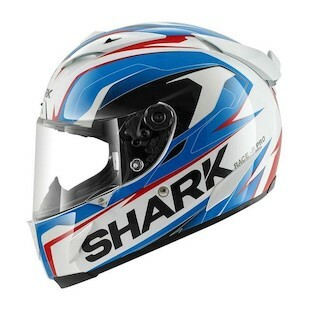 The Shark Race-R Pro is replacing the RSR 2, big advances in function, style and technology. Built for Moto GP, for the race tuck positioning, super aerodynamic and lightweight weighing 3.6 oz. It fits more of a rounded oval head shape. Shark Race-R Pro has 6 intakes: 2 position spoiler, brow vents to the shield, 2 chimneys on top, 2 vents in back. Extactors help to flow air and vaccum warm moist air away from your head. There are frontal extractors along the jawline, winglets along the back, a chimney extractor plus the double blade spoiler with extractors. 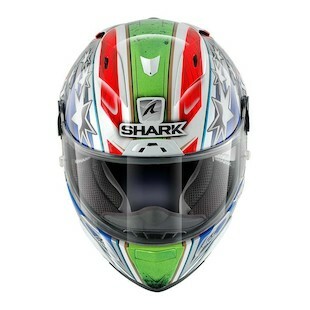 This is the most advanced shell in the Shark lineup: made with aramid and carbon fibers. As with the Vision-R and Speed-R in the new line of Shark helmets, the Race-R-Pro has a panoramic aperture with heavy duty polycarbonate face shield with an auto seal system for better soundproofing. It offers many of the other features from this line: double d ring magnetic chin strap, comfort, removable and washable, antibacterial liner, neck roll with neoprene sections for elasticity and water resistance, breath guard, chin curtain and easy fit glasses system. Shark Race-R Pro Redding Replica, Shark Race-R Pro De Puniet Replica.